Four teams of the Chinese PLA Army participating in the International Army Games (IAG) 2017 flew to Russia on July 20, 2017. A joint military drill of the special forces of Nepal Army and Chinese People’s Liberation Army kicked off here in Kathmandu on Sunday. 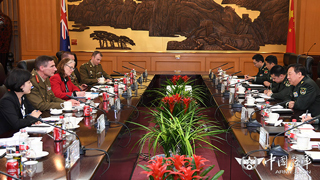 PLA Army Commander General Li Zuocheng held talks on Thursday afternoon with visiting Australian Army Chief Lieutenant General Angus Campbell in Beijing. The second Pakistan Army Team Spirit competition kicked off at a military barracks in Kharian of Pakistan on April 3, 2017. The Chinese PLA Army participated in the event for the first time. 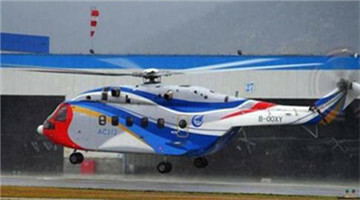 Two test pilots from the PLA Army Aviation Corps completed the last airworthiness verification item with AC313 helicopter in heavy rain in late March. General Li Zuocheng, commander of the Chinese PLA Army, met with visiting Pakistan's Chief of Army Staff General Qamar Javed Bajwa in Beijing on the afternoon of March 16, 2017. 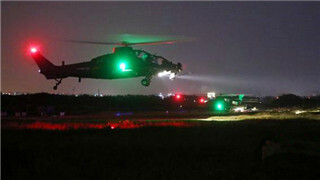 A military helicopter crashed in an area near Xiazhuwei Village, Jieshan Town, Quangang District, Quanzhou City, southeast China's Fujian Province, at around 19:20 pm on January 19, and two pilots were missing, according to the military sources on Friday. 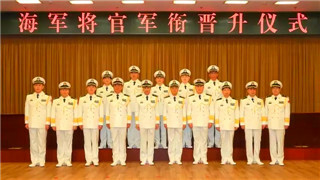 The Chinese PLA Army and Navy held military rank promotion ceremonies respectively on Jan. 17 and 20, 2017 in Beijing. The 37th World Military Judo Championships of the International Military Sports Council (CISM) kicked off in Zurich, Switzerland on December 9, local time. The first international army competition hosted by the Pakistani Army came to an end on October 24. The Chinese delegation to the contest won three group champions out of the five subjects. 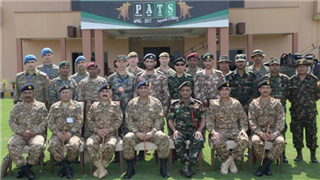 The "Friendship-2016" joint anti-terrorism training of the Chinese and Pakistani armies was held at Pakistani national anti-terrorism training center on October 18. Chinese Troops Arrive in Kyrgyzstan for "Pease Mission-2016"
Chinese troops participating in the "Peace Mission-2016" joint anti-terrorism military exercise of the SCO arrived at a training center in Balykchy in the Issyk-Kul Region of Kyrgyzstan on Sept. 13, local time. The Chinese PLA Army Commander Gen. Li Zuocheng held talks with the U.S. Army Chief of Staff Gen. Mark Milley in Beijing on August 16. The "Firepower-2016•Shandan" military exercise kicked off on August 10 at a training base in northwest China. The Chinese PLA Aviation is a vital component of the ground force, an important mark of the ground force transforming from flat to three-dimensional, and a key support in building a modern and strong army. The mobilization meeting for a brigade of the PLA 54th Group Army participating in the "Firepower-2016 Qingtongxia D" trans-Theater Command exercise was held on July 31, marking the official opening of the D stage of the "Firepower-2016 Qingtongxia" military exercise. Members of 17 teams from the Chinese PLA Army for the International Army Games 2016 have all reached the competition areas in Russia and Kazakhstan together with part of the hardware. Over 1,000 troops in 22 teams of the People’s Liberation Army (PLA) delegation departed from Beijing, Zhengzhou, Guangzhou and Urumqi respectively by air at wee hours of July 21 for Russia and Kazakhstan to participate in the International Army Games 2016. The "Stride 2016•Zhurihe A", a trans-Theatre Commands confrontation drill held by the PLA Army, kicked off at the Zhurihe Training Base in North China's Inner Mongolia Autonomous Region on July 15, 2016. The Firepower-2016 Qingtongxia cross-region military exercise kicked off Monday at a training range at the foot of the Helan Mountains in northwest China. The seventh annual international sniper competition wrapped up on the afternoon of June 25 in Kazakhstan. The Chinese team sniped seven first places out of the 14 subjects, ranking the first in total number of gold medals and total number of overall medals. A confrontation drill involving commanding organs of an air defense brigade under the PLA Army concluded in the Air Defense Force Academy in Zhenzhou, capital city of central China's Henan Province on Sunday. The PLA Army's leading organs and its Beijing-based subordinate units have officially initiated a pilot program of online purchasing of petty and sporadic supplies as of June 1, aiming to deepen the military procurement reform and regulate the purchasing behavior of petty and sporadic supplies. Chinese President Xi Jinping has called on the ground force of the People's Liberation Army (PLA) to transform and build itself into a "mighty, modernized, new-style" military force. A setting-out ceremony for the troops participating in the Engineering Formula competition in Russia was held at an engineering regiment of the PLA Western Theater Command on July 19. Three WZ-10 attack helicopters fly at extremely low altitude after taking off at a military airfield on May 19, 2016. An army aviation regiment of the PLA Army's 54th Combined Corps carried out airborne assault training exercise on May 19, 2016. 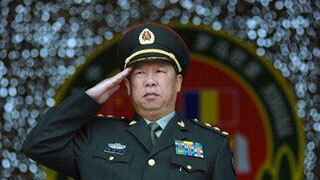 China's newly established five military theater commands have disclosed the locations of their army headquarters, an insider told the Global Times. PLA forces have pledged to support and contribute to China's ongoing comprehensive reforms in national defense and the military.